One incredibly gorgeous day I took myself out to lunch on a patio in downtown. Shortly after I'd arrived, a grackle swooped in and parked himself on the planter near me. Clearly he did not know that I wouldn't share. Soon after, another bird swooped into the dining area and grabbed a French fry. Didn't matter to him that there were people everywhere. He was getting the damn fry! Can't blame him. I love fries too. Looking at the bird with the fry in his mouth, I was reminded of the meme "Today I will be happier than a bird with a french fry." I thought to myself, "No. 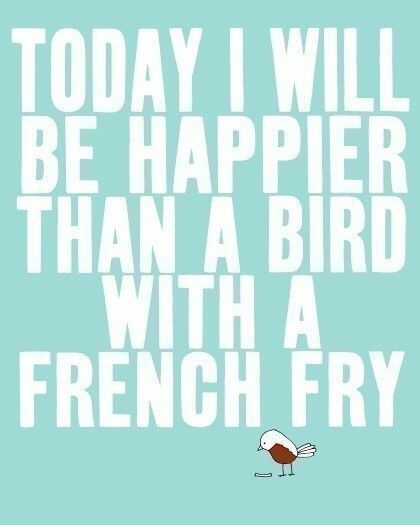 Today I will be braver than a bird going for a french fry." All too often, we're not brave enough to go for the happiness in which we seek. Sure, that bird with a french fry is happy, but he had to get it first. What is it that you want but are afraid to go for? Today choose one thing that will move you forward towards it, then swoop in like that bird making his play. Want to be better at marketing yourself and your work? Start your plan. Set your goals and think about strategies on how to achieve them. Want to make time for a passion project? Simplify your schedule. What is an item (or more!) on your schedule that you either dread or just don't want to go to? Remove it. Want to write a book? Write a page, form the outline or even just decide the topic. Want to start a business? Decide your idea, research your market, or play with names. It doesn't matter what you do, you just have to do it. Pro tip: oh-so-often the scariest things often prove to be the most satisfying and/or have the best results. Confession time: I was *really* nervous about publishing last week's blog. I procrastinated publishing it for longer than I care to admit to. It's also my most popular post so far! Every time I've been really nervous about something, it's often turned out to be a damn fine decision once I finally went for it! What will you start today? Share with us in the comments...then go do it! Need help? Click here to schedule a FREE phone chat. It’ll only take a couple of clicks to do and you can count that as your leap of bravery for the day!